Not long after Hip Hop had become established as a genre, one of its most important innovations occurred when producers began to sample Jazz instead of the more common Disco and Rock. Some of the first artists to combine the two genres in this way included Gang Starr, Digable Planets, and members of the collective Native Tongues, De La Soul, The Jungle Brothers, and the main focus of this paper, A Tribe Called Quest. These groups all formed in the late 80s and released revolutionary jazz-influenced albums throughout the early 90s. Analysis of any of the albums from those groups at that time would support my argument, however The Low End Theory,the album by A Tribe Called Quest, which contains tracks, “Jazz (We’ve Got)” and “Buggin’ Out”, is arguably the most clear example as well as one of the most critically acclaimed Hip Hop albums of all time (Hart). 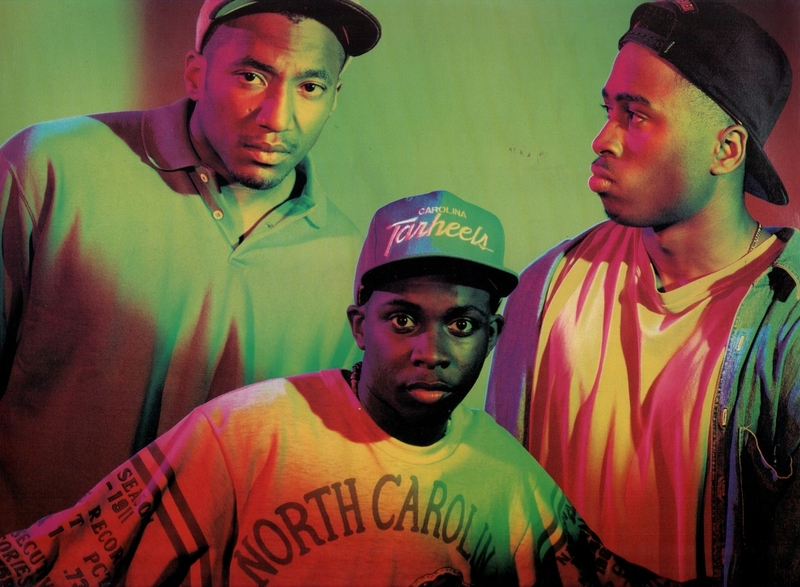 A Tribe Called Quest was a self-proclaimed “Hip Hop Band” consisting of members Q-Tip, Phife Dawg, and Ali Shaheed Muhammad. As the title of track 11, “Jazz (We’ve Got)”, suggests, the music on The Low End Theoryis heavily inspired by Jazz and wears that influence on its sleeve. In the first verse of “Excursions”, the opening song of the album, Q-Tip references this influence by comparing Hip Hop to Bebop Jazz in the lines, “You could find the Abstract listenin’ to hip-hop/My pops used to say, it reminded him of Bebop/I said, Well, Daddy, don’t you know that things go in cycles?/Way that Bobby Brown is just amping like Michael”. The most obvious musical influence is in the samples found within the instrumentals. Though not all of the samples on the album are credited, some of the more prominent ones were cleared and are listed at the end of the CD booklet and most originate from jazz or funk records. “Vibes and Stuff” uses a sample from jazz guitarist Grant Green and “Check the Rhime” uses a horn sample from Average White Band’s song “Love Your Life”. Though it isn’t credited on the album, a bit of digging on whosampled.com shows that the song “Jazz (We’ve Got)” uses a sample from the piece “Green Dolphin Street” by Jazz/Blues Pianist Jimmy McGriff. A Tribe Called Quest even goes beyond sampling and recruits famous Jazz Double Bassist, Ron Carter, to play the bassline on the Q-Tip solo track, “Verses from the Abstract” (The Low End Theory). After finding all of those samples used on The Low End Theory, Q Tip’s earlier comparison of ATCQ’s own music to Bebop Jazz doesn’t actually seem to fit at first glance. If Bebop Jazz and Hip Hop were really that similar, it would make sense that A Tribe Called Quest would be using Bebop samples, however that wasn’t usually the case. Both the vibraphone sample in “Jazz (We’ve Got)” and the guitar sample in “Vibes and Stuff” are closer to Soul Jazz than Bebop Jazz (Oxford Music, “Jazz”). Though the samples are quite different from Bebop Jazz, the comparison is still accurate because of the Hip Hop elements present in the music of A Tribe Called Quest, which contains similar stylistic elements of high energy and intensity. “Jazz (We’ve Got)” and “Vibes and Stuff” are clearly Hip Hop songs rather than Jazz pieces due to the repetition in the sampling and more importantly, the drum focus. Hip Hop drums are also typically sampled, but are almost always some of the most prominent sounds in a song. They tend to be fairly straightforward rhythmically, with a focus on heavy kicks on at least the 1stand 3rdbeats and snares on the 2ndand 4thbeat that are usually loud and central in the mix. This style of drum programing creates a higher energy than the more abstract drums present in most Soul Jazz and is more similar to drum grooves in Rock and Pop music of the 70s and 80s, a genre the youth of the time would have associated with rebellion, dancing, and partying. The drums on The Low End Theorywere within the Hip Hop style, but were different from the drums in earlier songs like “It’s Tricky” and “Rapper’s Delight” in that they have swing and lag slightly behind beat, which like so many of their other stylistic choices, is more common in Jazz. The Low End Theory was not the first, or only Hip Hop album to make use of jazz sampling, but combining elements from multiple forms of Jazz and within the stylistic parameters of Hip Hop, A Tribe Called Quest was able to fuse the two genres in a unique way that resonated with their audience and created a new space within Hip Hop that would flourish in years to come.